Name origins: “Caeno-” is a variant of “Ceno-,” which is Greek for new. Thus, caenogastropods are “new gastropods.” Caenogastropoda is the most diverse clade of Gastropoda (>23,000 living species; WoRMS database) and also the most ecologically successful. Species occur not only in marine habitats, but also in freshwater and on land; their diets are equally varied (Osca et al., 2015). Like the Gastropoda more broadly, uncertainty remains regarding the internal relationships of major groups of Caenogastropoda. For example, Osca et al. (2015) recently used mitochondrial genomic data to test the phylogenetic status of three traditionally recognized clades–Neogastropoda, Architaenioglossa, and Littorinimorpha (which includes many species once recognized as “Mesogastropoda”)–and found that the latter two formed paraphyletic “grades” within the Caenogastropoda. 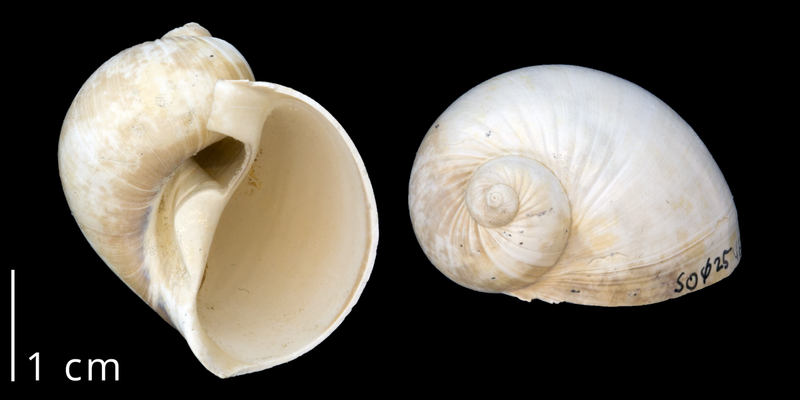 They did find broad support, however, for a clade of “siphonate” gastropods within the Caenogastropoda, which are characterized by having shells with a siphonal canal. Most of these siphonate caenogastropods belong to the monophyletic Neogastropoda clade. Neogastropods are all predators and some, like the cone snails, use powerful neurotoxins in conjunction with harpoon-like delivery systems to immobilize and capture their prey. The time-calibrated gastropod phylogeny recently presented by Zapata et al. (2014) suggests that Caenogastropoda diversified sometime in the late Permian or early Triassic. 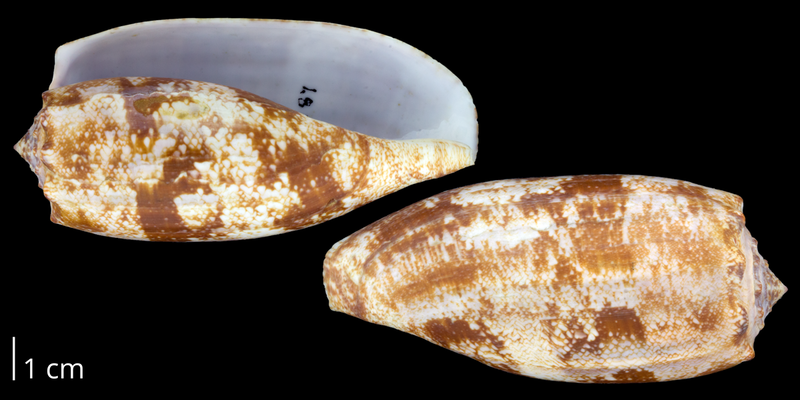 Family Conidae: Modern Conus geographus from Sri Lanka (PRI 54489). Family Busyconidae: Fossil Sinistrofulgur contrarium from the late Pliocene Tamiami Formation (Pinecrest Beds) of Florida (PRI 70051). Family Ficidae: Fossil Ficus from the late Pliocene Tamiami Fm. (Pinecrest Beds) of Florida (PRI 70047). 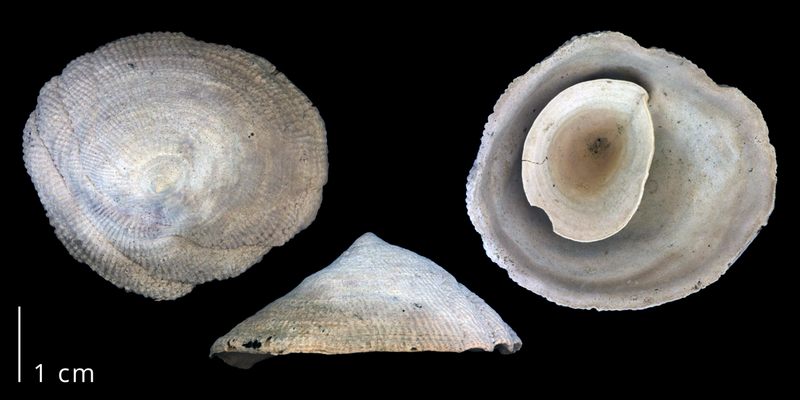 Family Strombidae: Fossil Strombus from the late Pliocene Tamiami Formation (Pinecrest Beds) of Florida (PRI 70052). 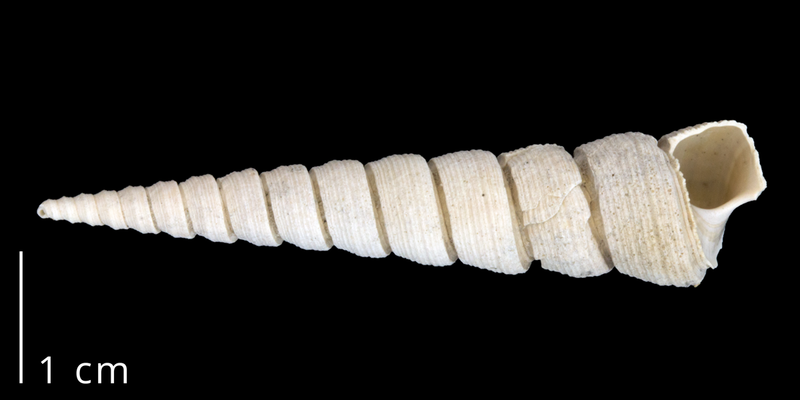 Family Turritellidae: Fossil Turritella magnasulcus from the late Pliocene Tamiami Fm. (Pinecrest Beds) of Florida (PRI 70049). Family Calyptraeidae: Fossil Crucibulum auricula from the late Pliocene Tamiami Fm. (Pinecrest Beds) of Florida (PRI 70055). Family Calyptraeidae: Fossil Calyptraea centralis from the late Pliocene Tamiami Fm. (Pinecrest Beds) of Florida (PRI 70046). Family Drillidae: Fossil Cymatosyrinx aclinica from the late Pliocene Tamiami Fm. (Pinecrest Beds) of Florida (PRI 70050). Family Naticidae: Fossil Naticarius plicatella from the late Pliocene Tamiami Fm. (Pinecrest Beds) of Florida (PRI 70044). 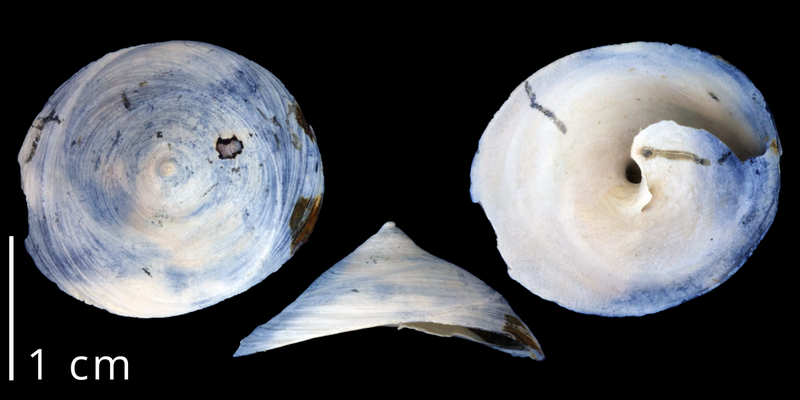 Family Ampullariidae: Modern Pomacea palluclosa from Lake Tsala Apopka, Florida (PRI 70096). 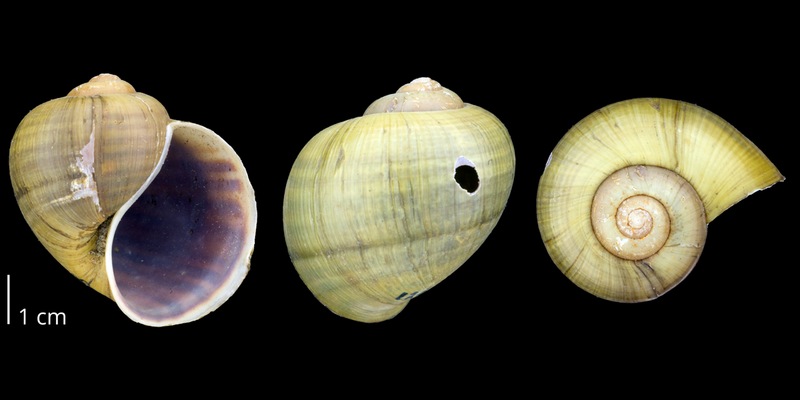 Pomacea palluclosa, from Lake Tsala Apopka, Florida (PRI 70096). Pomacea is a genus of freshwater snails–commonly known as “apple snails” or “mystery snails”–that includes a species native to Florida. They belong to the Ampullaroidea clade and are traditionally classified as members of the Architaenioglossa. These snails are sometimes kept as pets and care tips are presented in the video below. The large shells of the Queen Conch, Lobatus gigas, are perhaps the most iconic of all Caribbean seashells. The flesh of this herbivorous species is edible, but over harvesting has resulted in dwindling populations. The video below discusses the natural history of the Queen Conch, which belongs in the Stromboidea clade (traditionally classified as a group of Littorinimorpha). A specimen of Conus geographus from Sri Lanka (PRI 54489). 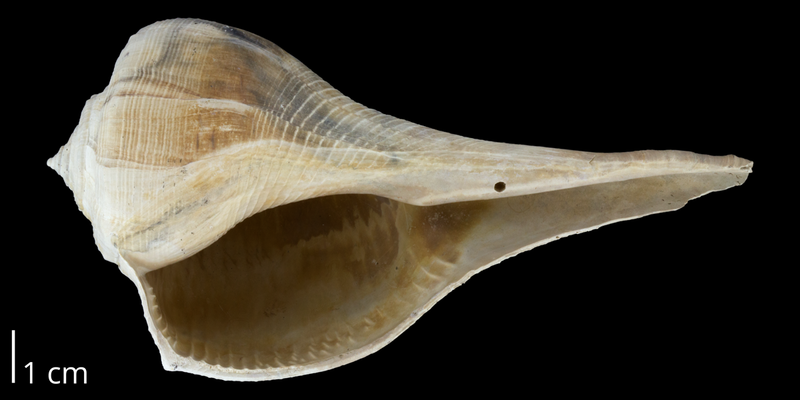 The Indo-Pacific cone snail Conus geographus is sometimes referred to as the “cigarette cone” for an ominous reason: if you are stung by it, you may only live long enough to smoke a single cigarette before you die. 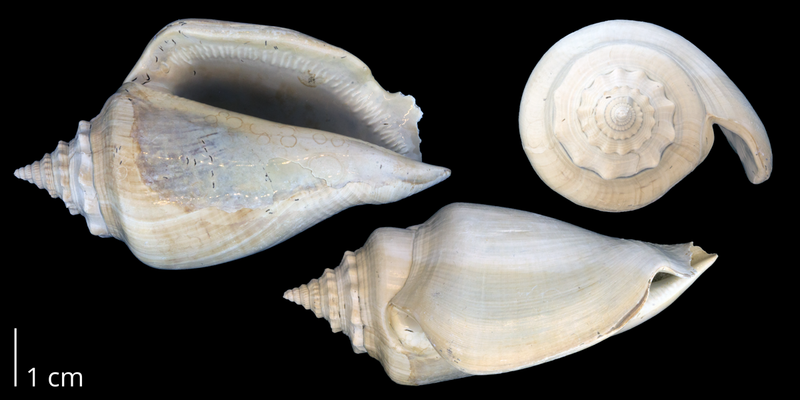 Like all cone snails, Conus geographus is a venomous predator. Unlike most cone snails–a majority of which eat worms–the cigarette cone hunts small fish. Because its neurotoxins–termed “conotoxins”–target the vertebrate nervous system (many aspects of which humans and fish share in common), defensive stings delivered to unwary shell collectors can be fatal. University of Washington Professor Emeritus Alan Kohn has spent much of his career researching the natural history of cone snails and was the first to discover that this particular species eats fish. 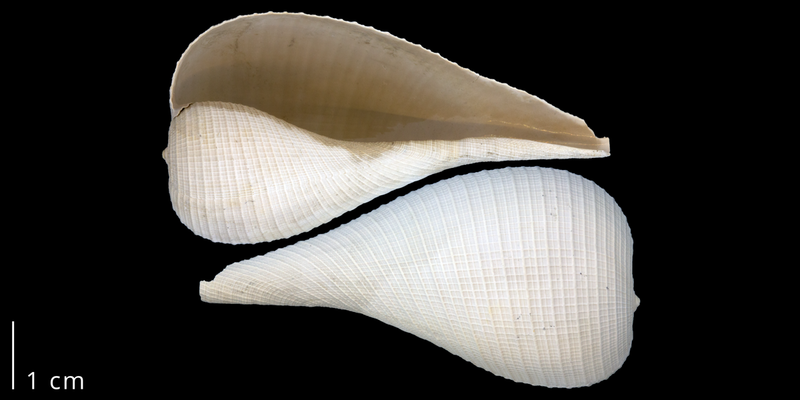 Dr. Kohn recently reviewed all medically documented cases of cone snail stings and found that Conus geographus has been responsible for at least 30 human deaths (Kohn, 2016), which is typically caused by muscle paralysis leading to respiratory failure. An envenomation event in Queensland, Australia in 2015–perhaps by Conus geographus–is recounted here. For more information about the “cigarette cone”–a type of neogastropod–watch the video below. The venoms of cone snails and related species are currently receiving considerable attention for their potential uses in varied pharmacological applications. The video below describes some of the research done in the laboratory of Dr. Mandë Holford, who is one of the lead investigators in this fascinating area of study. Bouchet and Gofas (2013) recognize the following gastropod families as members of the Caenogastropoda († indicates extinct families). This list was copied from the World Register of Marine Species (WoRMS) on February 2, 2017 and is reposted here in concordance with the source material’s Creative Commons BY 4.0 license. The link associated with each name will direct you to additional information about that family on WoRMS. Family Calyptraeidae Lamarck, 1809; learn more at the Neogene Atlas. Family Cypraeidae Rafinesque, 1815; learn more at the Neogene Atlas. Family Naticidae Guilding, 1834; learn more at the Neogene Atlas. Family Strombidae Rafinesque, 1815; learn more at the Neogene Atlas. Family Bursidae Thiele, 1925; learn more at the Neogene Atlas. Family Cassidae Latreille, 1825; learn more at the Neogene Atlas. Family Personidae Gray, 1854; learn more at the Neogene Atlas. Family Ranellidae Gray, 1854; learn more at the Neogene Atlas. Family Tonnidae Suter, 1913 (1825); learn more at the Neogene Atlas. Family Hipponicidae Troschel, 1861; learn more at the Neogene Atlas. Family Vermetidae Rafinesque, 1815; learn more at the Neogene Atlas. Family Xenophoridae Troschel, 1852 (1840); learn more at the Neogene Atlas. Family Buccinidae Rafinesque, 1815; learn more at the Neogene Atlas. Family Fasciolariidae Gray, 1853; learn more at the Neogene Atlas. Family Nassariidae Iredale, 1916 (1835); learn more at the Neogene Atlas. Family Cancellariidae Forbes & Hanley, 1851; learn more at the Neogene Atlas. Family Clavatulidae Gray, 1853; learn more at the Neogene Atlas. Family Conidae Fleming, 1822; learn more at the Neogene Atlas. Family Drilliidae Olsson, 1964; learn more at the Neogene Atlas. Family Horaiclavidae Bouchet, Kantor, Sysoev & Puillandre, 2011; learn more at the Neogene Atlas. Family Mangeliidae P. Fischer, 1883; learn more at the Neogene Atlas. Family Muricidae Rafinesque, 1815; learn more at the Neogene Atlas. Family Turbinellidae Swainson, 1835; learn more at the Neogene Atlas. Family Olividae Latreille, 1825; learn more at the Neogene Atlas. 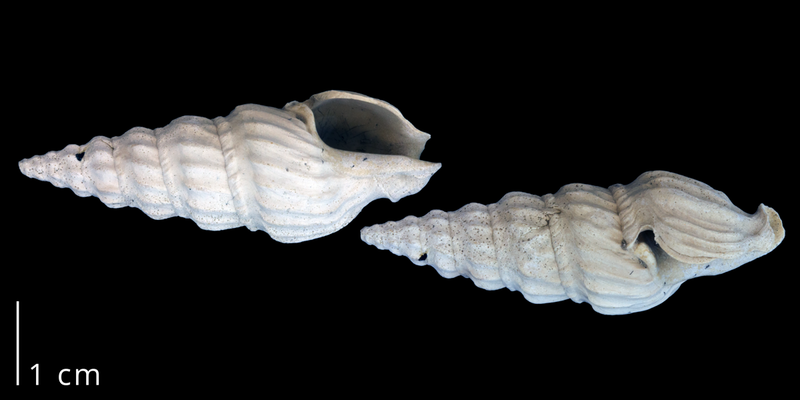 Family Turritellidae Lovén, 1847; learn more at the Neogene Atlas. Family Pseudomelaniidae R. Hoernes, 1884 †; learn more at the Neogene Atlas. Bouchet, P. and S. Gofas. 2013. Caenogastropoda. Accessed on February 2, 2017 through: World Register of Marine Species at http://www.marinespecies.org/aphia.php?p=taxdetails&id=224570. Kohn, A. J. 2016. Human injuries and fatalities due to venomous marine snails of the family Conidae. International Journal of Clinical Pharmacology and Therapeutics, 54(7): 524-538. DOI: 10.5414/CP202630. Link. Osca, D., J. Templado, and R. Zardoya. 2015. Caenogastropod mitogenomics. Molecular Phylogenetics and Evolution, 93: 118-128. DOI: http://dx.doi.org/10.1016/j.ympev.2015.07.011. Link.